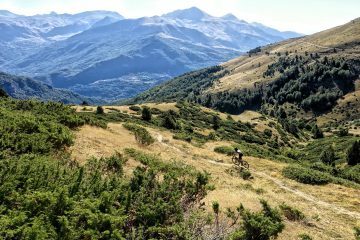 Discover the varied and beautiful 100% natural riding of the Luchon area on a guided mountain bike holiday in the Pyrenees mountains of SW France. 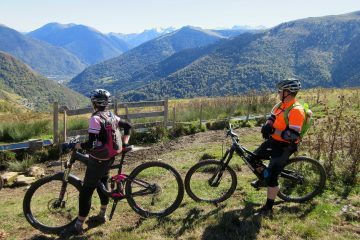 Mountain bikers who like their riding natural and adventurous will be in their element in the Pyrenees. The singletrack is sublime and the switchbacks are challenging. From long and demanding fire-road climbs that give amazing views of the mountains as you ride, to flowy technical mountain descents, whatever your riding preference, we can provide it here. 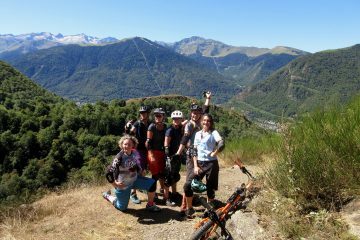 Our mountain biking holiday adventures are guided by local professionals who orientate the days riding around your wishes and ability. Our MTB coaching weeks are likewise designed around what you need to get out of them. 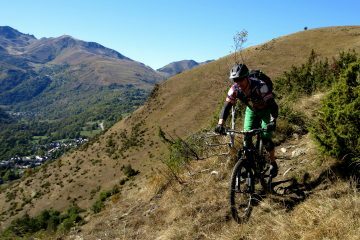 We offer amazing flexibility in our mountain biking holidays, but if you don’t see exactly what you want contact us to discuss your bespoke MTB holiday requirements. Whilst women are more than welcome on all of our MTB trips, and many women enjoy riding on our mixed biking breaks, some women mountain bikers feel that they gain more in a women only group. If this is you, then our womens mountain biking holidays are always full of laughs and encouragement, not to mention support. As with all of our other MTB breaks the riding is selected with your riding abilities and preferences in mind. Looking forward to joining you out on some dusty MTB trails.